Game Description Welcome to AGI Mouse 1.1! 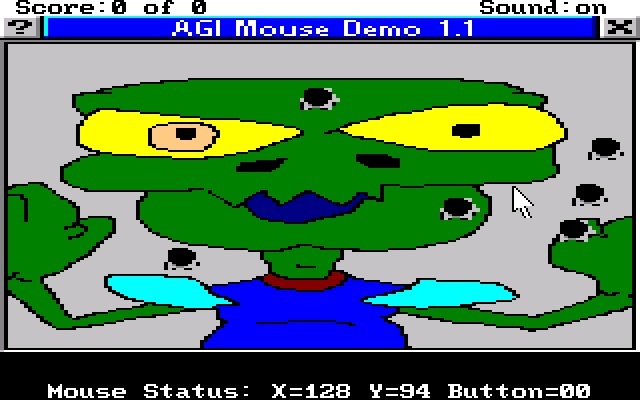 AGI Mouse 1.1 gives you the ability to program AGI with a powerful mouse API and greatly improve the quality of games and programs you make with the Adventure Game Interpreter. It's a demo demonstrating mouse support for AGI. It is exactly what it claims to be. But there is no story or music and the graphics are what you can see from the screenshot. So as far as a game goes, this isn't one. On the other hand, if you are trying to figure out how to get the mouse up and running in an AGI game, this should definitely be a reference to look at.